Ken joined Watsi on November 26th, 2015. 8 other people also joined Watsi on that day! Ken's most recent donation supported Ra, a rice farmer from Cambodia, for surgery to restore his vision. Ken has funded healthcare for 14 patients in 3 countries. Meet Ra, a 35-year-old man from Cambodia. Ra is a rice farmer, and is married without children. "He enjoys fishing and watching boxing on TV," says our medical partner, Children’s Surgical Centre (CSC). “Two years ago Ra developed a cataract in each eye. This causes him blurred vision, irritation, and tearing," shares CSC. Cataracts occur when the lens inside the eye becomes cloudy from age or trauma, and if left untreated, can lead to decreased vision and even blindness. Ra tells CSC, "I can't do my work well or walk outside easily. It is difficult to recognize faces." Ra and his wife traveled four hours to seek medical attention for Ra at CSC. $225 will fund surgery to remove both of Ra’s cataracts. CSC reports after the procedure, "Ra will be able to see clearly again." Cataract surgery consists of removing the cloudy lens and placing a clear lens implant in its place. Ra shares, "I hope my eyes can see everything clear again because I want to do my work on the farm very well. I want to one day open a shop for selling fruit." Meet Soeung, a 68-year-old woman from Cambodia. "Soeung is married with two sons, two daughters, and 13 grandchildren. She enjoys visiting the pagoda and listening to the monks praying," says our medical partner, Children’s Surgical Centre (CSC). “Two years ago Soeung developed a cataract in each eye. This causes her blurred vision, tearing, and irritation," shares CSC. Cataracts occur when the lens inside the eye becomes cloudy from age or trauma. If left untreated Soeung’s cataract could lead to decreased vision and even blindness. Soeung tells CSC, "My vision is cloudy. I can't walk very well or recognize the faces of people clearly. My work is hard to do." $225 will fund surgery to remove both of Soeung’s cataracts. CSC reports after the procedure, "Soeung will be able to see clearly again." Cataract surgery has high impact for improving visual acuity and improving quality of life. Soeung shares, "I hope my eyes will be able to see everything clearly again and I can help my family do some house work and work on the farm. I want to take care of my grandchild at home too." Meet Oeun, a 63-year-old woman from Cambodia. Our medical partner, Children’s Surgical Centre (CSC), shares, “Oeun is married with two sons, five daughters, and ten grandchildren. She spends her free time planting bananas around her home and caring for her yard.” Two years ago, Oeun developed mature cataracts in both eyes. A cataract occurs when a thin, cloudy layer forms over the eye’s lens. This condition can cause extreme discomfort, vision loss, or even functional blindness. According to CSC, because of her cataracts, Oeun’s eyes burn, tear up, and are irritated by bright lights. “It is hard to see anything clearly, and I cannot go outside on my own,” shares Oeun, “I can't even recognize the faces of my relatives." After learning about CSC from a neighbor, Oeun and her niece traveled five hours to visit their clinic; they learned that, after a simple and highly-effective surgical procedure, Oeun may regain her sight. With $225, Oeun will undergo cataract surgery, during which her old lenses will be removed and replaced with sheer artificial implants--allowing Oeun to regain sight immediately after her operation. Oeun’s niece shares, "I hope my aunt will be able to see everything clearer so she can easily do her work and go anywhere by herself." Meet Thorn, a 58-year-old mother and grandmother who lives in Cambodia. Thorn enjoys watching Thai dramas on television and doing housework. "Two years ago Thorn developed a cataract in each eye," explains our medical partner, Children's Surgical Centre (CSC). "This causes her blurred vision and pain." A cataract is a thickened, cloudy lens. Over time, the altered lens loses its ability to focus light properly, resulting in blurry or dull vision and difficulty seeing faraway objects. Cataracts account for 50 percent of all cases of blindness worldwide, and formation typically occurs in both eyes, as Thorn is experiencing. $225 will cover the cost of surgery to remove the cloudy lenses from both of Thorn’s eyes and replace them with artificial lenses. This amount also includes post-operative follow-up care. After surgery, "Thorn's vision will improve and she will have regained independence," CSC tells us. Thorn shares her hopes after surgery: "I hope my eyes can see everything clearly again and I don't have to worry about my eyes becoming blind. I hope I will be able to do my work and can go anywhere outside by myself very well." Thorn's son adds: "I hope my mother can see everything clearly again after treatment. I hope I won't have to worry about her eyes having problems in the future." Sok Ly is a 68-year-old wife and grandmother who lives in Cambodia. She enjoys visiting the pagoda to listen to the praying monks, and watching Khmer dramas and social news channels on television. "Two months ago Sok Ly developed a cataract in each eye," explains our medical partner, Children’s Surgical Centre (CSC). "This causes her blurred vision, pain, and tearing." A cataract is a thickened, cloudy lens. Over time, the altered lens loses its ability to focus light properly, resulting in blurry or dull vision and difficulty seeing far away objects. Cataracts account for 50 percent of all cases of blindness worldwide, and formation typically occurs in both eyes, as Sok Ly is experiencing. "It is hard to see everything and everyone's faces clearly, and do my work and walk outside" says Sok Ly. $225 will cover the cost of surgery to remove the cloudy lenses from both of Sok Ly’s eyes and replace them with artificial lenses. Funding for Sok Ly’s treatment also includes post-operative follow-up care. After surgery, "Sok Ly will be able to see everything much better," CSC tells us. Sok Ly shares: "I hope my eyes can see everything clearly again so I'm not worried about my eye losing any more vision. After treatment I hope I can sell groceries at the market to earn money to support my family. I hope I will be able to easily go anywhere outside by myself." Her husband adds, "I hope I don't have to worry about her eyes having problems in the future." Yann is a 67-year-old grandmother from Cambodia. She and her husband have two daughters and four grandchildren. Our medical partner, Children’s Surgical Centre (CSC), shares, “Yann spends her time doing house work and watching TV. She enjoys watching Korean dramas and social news.” “Six months ago, Yann developed a cataract in each eye,” CSC explains. “This causes her blurred vision, discharge, and tearing.” A cataract develops as proteins begin to cloud the lens of the eye. Untreated, the proteins continue to develop and cloud the lens, obstructing the patient’s vision. Yann explains, “It is hard for me to do any work at home or go outside on my own. I can’t recognize the faces of people clearly.” For $225, Yann will receive surgery to remove her cataracts. During the procedure, a surgeon will make a small incision in each eye to remove the clouded lens and replace it with an artificial substitute. Most patients recover from the operation within 1-2 days. After the recovery period, Yann will have her vision fully restored. Yann and her family are excited about the positive impact this operation will have on her life. Yann adds, "I hope my eyes can see everything clearly again and that I can easily go walking outside by myself." Meet Nem, a 68-year-old woman from Cambodia. Our medical partner, Children’s Surgical Centre (CSC) tells us, “Nem is married with two sons, three daughters, and 12 grandchildren. She enjoys going to the pagoda to join in ceremonies.” One year ago, Nem developed cataracts in both of her eyes. This condition causes a filmy layer to develop over the eye lens. Due to vision loss, cataracts often detract from a patient’s overall independence. “My vision is cloudy,” Nem explains. “I can't do my work very well or go walking by myself. It is hard to see the faces of people clearly.” Hopeful for treatment, Nem and her nephew traveled three hours to reach CSC’s clinic. For $225, Nem will receive cataract surgery to remove the cloudy lens and replace it with a clear lens implant. This is a widely practiced procedure and only takes about an hour. Afterwards, Nem will be able to see clearly again. Nem shares, "I hope I can see everything clearer than now so I can take care of my grandchildren at home easily, and go walking anywhere outside by myself." Meet Sany, a 67-year-old father of eight and grandfather of 15 who lives in Cambodia. Sany is a craftsman and enjoys making wooden desks and chairs at home in his free time. "Sany developed a cataract in his right eye five years ago," our medical partner Children's Surgical Centre (CSC), tells us. A cataract occurs when the lens inside the eye becomes cloudy. This can cause functional blindness, where the patient can only see finger or hand motions without any details. Sany's cataract has caused blurred vision, tearing, and overall impaired his ability to see clearly. Because of this, his daily activities are much more difficult. "I can't do any work that well or go outside by myself very far," says Sany. Sany travelled three hours with his daughter to reach CSC for proper treatment. For $150, he will receive a lens replacement, where doctors at CSC will remove the cloudy lens in Sany's right eye and replace it with a clear lens implant. Within one day after his operation, Sany will be able to see clearly again. "I want to see everything clearly again so I can do any work well like making tables and chairs, and repairing radios and TVs to earn money for my family," Sany says. "I hope I will be able to walk outside by myself." 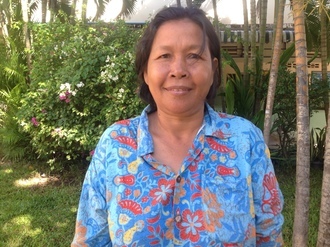 Meet Sokkoeun, a 56-year-old woman from Cambodia. “Sokkoeun is married with one son and three daughters,” says our medical partner, Children’s Surgical Centre (CSC). “She sells sweet fruits to support her family, and enjoys watching the news on TV.” Sokkoeun recently fell down from a tree and dislocated her left elbow. "I can't bend my elbow or carry anything without feeling pain and numbness in my left arm,” shares Sokkoeun. “Sokkoeun travelled three hours with her son to reach CSC for treatment,” says CSC. “She received Khmer traditional medicine treatment for two months but her arm did not improve.” With $405 in funding, Sokkoeun will undergo open reduction and internal fixation surgery to realign her bone correctly and allow her elbow to heal. After the procedure, CSC expects her arm will regain mobility. "After treatment, I will go back to work to support my family,” shares Sokkoeun. “I hope my hand will function well and I can do anything for myself."